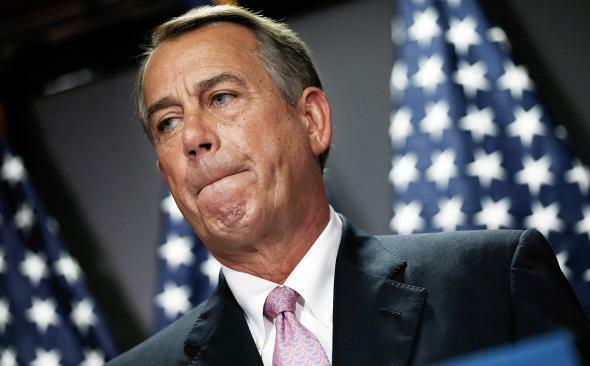 DHS immigration fight: John Boehner relents, agrees to hold vote on the Senate's clean Homeland Security funding bill. John Boehner ran out of options in the DHS fight. And so ends the latest threat of a partial government shutdown. House Speaker John Boehner told his GOP caucus Tuesday morning that the lower chamber will vote as soon as later Tuesday to fund the Department of Homeland Security for the remainder of the fiscal year. That bill—which lacks any of the immigration-reform-blocking strings that House conservatives had demanded in exchange for DHS funding—has already passed the Senate. The move won’t make Boehner any friends in the most conservative wing of his party, but the Ohio Republican doesn’t have any other viable options at this point. The short-term extension the House passed late last week expires Friday at midnight. After a conservative revolt, the speaker needed Democratic help to pass that one-week funding bill. But given Nancy Pelosi was unlikely to throw Boehner a second lifeline next time around, Boehner was left with only two real options in this round: a partial DHS shutdown, which he’s already gone to great lengths to avoid, or the Senate’s no-strings funding bill. “I believe this decision—considering where we are—is the right one for this team, and the right one for this country,” Boehner reportedly told his fellow House Republicans at a closed-door briefing Tuesday morning (details of which were quickly leaked to a number of Beltway publications). There are signs that the ending to this drama was actually scripted late last week after Boehner’s can-kicking bid for a three-week funding bill unexpectedly and embarrassingly failed to attract the support of enough of his party’s rank-and-file. The one-week extension that followed would have met the same fate—prompting a partial DHS shutdown—if it weren’t for the House Democrats who unexpectedly dropped their opposition to any short-term extension to vote for the bill. While Boehner’s office has denied he promised Pelosi a vote this week on the full funding bill in exchange for her party’s eleventh-hour help last Friday, Democrats have treated it as something closer to an open secret. Regardless of whether a deal was cut, though, the end result will be the same: Congress will pass the long-term funding bill that President Obama and his congressional allies have been demanding for weeks. Republicans, meanwhile, will be left with nothing to show for a fight that (again) exposed the deep ideological and strategic divide between House GOP hardliners and their more moderate colleagues in the House and Senate.